Happy Tuesday! I'm finally back in this space today to share my July report. I didn't mean to take a break, but things do seem to slow down a bit in the summer. I know I've been moving at a slower pace! I've been sewing a lot, but need to buckle down and take photographs of all my makes and just get back into the swing of things. July was pretty hot for us, so there were quite a few days that I couldn't work in my sewing room because of the heat. Some days I worked on the computer and for a few days I brought my machine to the kitchen to sew near the A/C unit. I still managed to get a lot done, which felt good. I picked up my Drachenfels shawl again. I'm now into the second section which has stripes, and I really love it. I know that it will be much more enjoyable from here on out. I'm really pleased with the colors I chose. Brushstrokes fabric by Holly DeGroot for Cloud 9 Fabrics. Looking at my goals, I did okay this month. I didn't end up working on my double wedding ring wedges. My goal was 15 per month which would have them finished in October. I've been making 16 per month, so I decided to let myself skip July and means I need to make 18 per month these next three months. 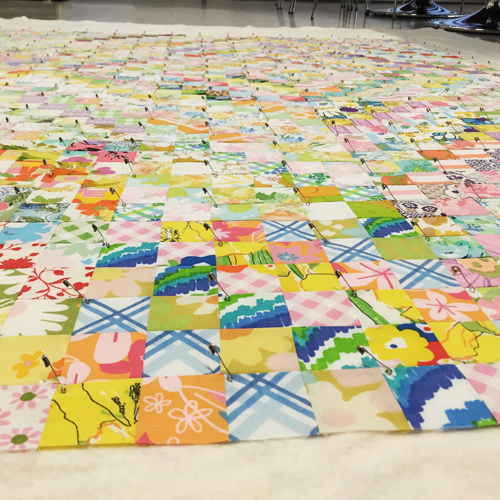 I completed one quilt start to finish, and completed three others. Two of the four I quilted myself, which I hadn't done in a long while! Just straight lines, but still! I also made a few quilt blocks and a scissor cozy. I worked on my Archer Popover, have plenty of details to finish up. I have two deadlines to work towards this month, and I'm also really hoping to release my two new patterns. Those are going to be my primary focus. 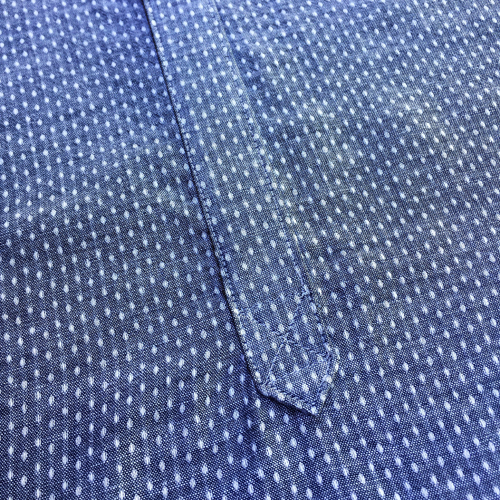 I'm starting to get excited about Fall, the weather makes it much more comfortable to sew! George bunny says "Hi!". I took this video of him in his giant bag of hay, he was enjoying a feast! It's a little dark but still enjoyable! Haha, George bunny is so cute! And so well behaved...when my bunny gets at his hay bag, he knocks it over and makes a big mess by dragging out hay all over the floor!! Oh! I can't wait to see what you are doing with Guising. I have a FQ set of that line and I'm saving it for something awesome! I had it in my stash forever, felt good to finally use it! Congratulations on finishing a quilt yourself! 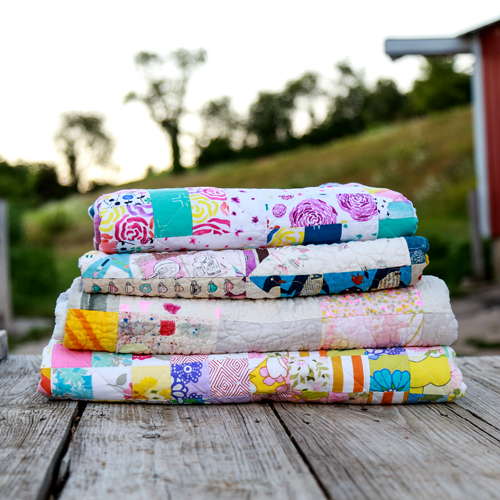 That vintage sheet quilt is to die for! Love the shawl...is it a beginner friendly pattern? I know some of the basics for knitting but would like to do more...any suggestions for easy to follow patterns or websites? Thanks! That shawl is coming along beautifully! I was checking out your ravelry page and am inspired to do a little knitting this fall. I love the hats you have made with lace patterns. I may give one a try! Thank you! Definitely, hats are so much fun to make! My favorite that I've made is the Swift hat, I wear it more than any other! Oh, George! You have made this hot, sticky day into one full of rainbows and unicorns :) And tell your mom I love her quilt projects--but especially her knitting today. Thanks! George and I are looking forward to cooler weather too! Re your fabric tally--How do you calculate how much fabric you have used in a quilt? When using bits and pieces I don't see how this can be done. Do you just make an estimate based on the quilt size. Please do tell. It depends on the quilt. Two of the quilts I finished this month used up every bit of the fat quarters I used, so the math is easy. 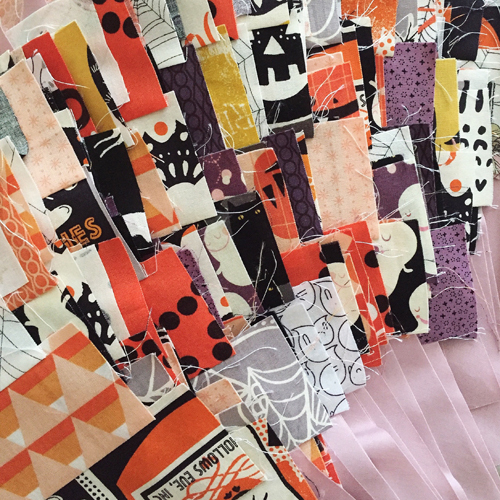 For quilts that use smaller pieces, I'll use the number squares and rectangles to calculate how many square inches of fabric it took, then divide by the number of square inches in a yard. There is some estimation/rounding, but it's pretty accurate. Thanks for the explanation. I think I will try it. George is so cute. I'd never thought about bunnies eating hay but that makes sense. I know at heart you are a math person but all that calculation for fabric usage ... wow! Lovely quilt top, though.